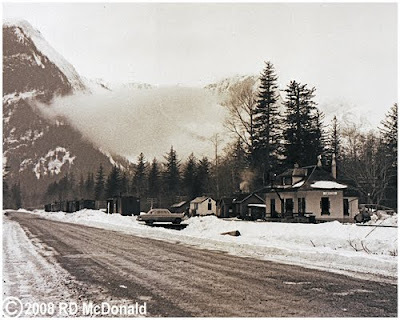 Kwinitsa Station, Smithers Division, Skeena Subdivision, MP 72.6, 1958. I finally located a photo for which I have been searching for some time. 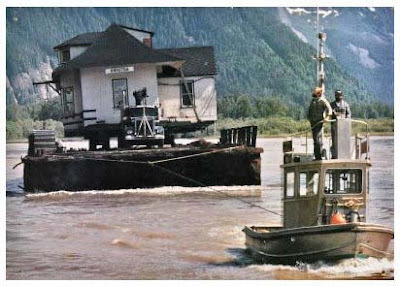 A shot of Kwinitsa Station, on a barge on the Skeena River, being moved to her new home. And boy, did the memories come flooding back, very powerful memories. As a young man, I spent some time at Kwinitsa Station, not waiting for a train as a passenger, but as an observer riding in the cab of log trains. Canadian National Railways special instructions contained in the employee timetable required a walking inspection of freight trains within the first fifty miles of departing Prince Rupert. That landed us on the 58 car siding running past the station. I never had time to venture in. Sometimes I would switch seats from the caboose with a brakeman, which allowed me to ride the cab the final 50 or so miles up to Terrace. We would do switching chores and pull loaded log cars back to the mill at Port Edward later in the afternoon. 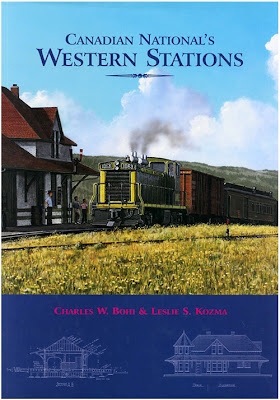 Author Charles Bohi in his two landmark books, “Canadian National’s Western Depots” (1977) and “Canadian National’s Western Stations” (2002) referred to Kwinitsa Station as a “Type E” station. See “Type E” Mythology,” where we put that concept to rest. The diesel age did more than send steam engines to the razor blade factory. An entire culture of stations, with agents and in many cases their families, were eliminated. 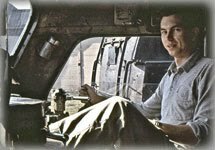 I had the good fortune through this blog to “meet” Chantel Miejer who actually lived at Kwinitsa Station, where her late Dad served as a large steel track foreman. See “Rinaldi and Family” with a photo of Chantal and siblings at Kwinitsa. 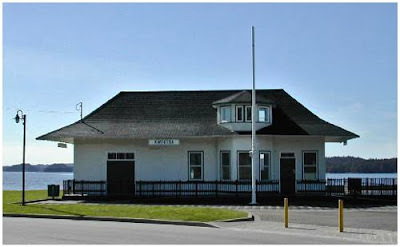 At the time we lived in Prince Rupert, 1957 – 1959, there were 20 stations on the 119.4 Skeena Subdivision between Pacific and Prince Rupert. 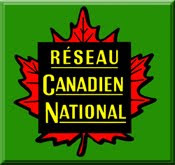 In the 1980’s, Canadian National began liquidating stations, bunkhouses, and other structures that were now obsolete. Chantal’s late Father was able to convince the railroad and the City of Terrace to load up the foreman’s quarters and rail them up to Terrace where the structure is now an important piece of railroad history. Kwinitsa Station was moved across the tracks, through eight or nine hundred feet of pucker brush, down the riverbank and onto a barge. She made her way 50 miles or so down the Skeena River and up into Prince Rupert Harbor, where she too, relates the often obscure railroad history of the remote Prince Rupert Extension. While waiting in Edmonds for a ferry last week, a commuter train ran past the ferry vehicle holding area, “bass-awkward.” Is that any way to run a train? But, in an era when a freight train doesn’t even have a caboose, I guess it doesn’t matter which comes first – the head or the tail. I didn’t even bother to take my camera out of the camera bag. Amazing to see the depot on a barge! Now I have seen everything! I agree - what a sight! Now, as for the modern toaster ovens, I've seen some start running through the "Meridian Speedway" with rear pushers. There aren't any mountain grades out here, but there's a definite role to the landscape. At any rate, I've started referring to the pusher as the caboose. At least I think it's funny, my wife isn't as impressed.